Like so many others before me, it all began simply. In 1995, my wife and I purchased a new house. The previous house was built into a hillside, and there were 42 steps to climb from street to front door. That, coupled with the somewhat dodgy neighborhood, meant that on average we had about two to six trick or treaters on Halloween. The new house has only three steps, and is in a really nice neighborhood. We figured we would have more trick or treaters. The next year my idea of “a little more” was to build a talking pumpkin. Since I came to this conclusion around September 28th, I realized I might have to scale my ambitions back just a bit. A talking pumpkin would mean doing a full pumpkin sculpture, making molds and casting a foam latex skin, and building a complicated fiberglass skull. However, a talking skull would be much easier since it would use a purchased plastic skull and not require mechanics nearly as complicated as the pumpkin. Hence, a talking skull it would be. 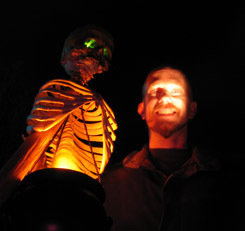 On October 1, I started writing software and designing/building custom electronics hardware for controlling the skull. I also purchased the plastic skull I was going to use and started getting the mechanics built for it. I worked like a fiend for the next four weeks and finally got everything working perfectly November 1st. Yes, after killing myself for weeks, my entire system suffered from a minor but “show stopping” bug. I vowed to do better next year. And I did. I got the skull talking, and built a scarecrow to mount him on. I added more lights, a giant spider web, more tombstones, a smoke machine, and sound effects. After the initial disaster of a manual smoke machine (either no one held the button to make smoke, or they did and there was so much you couldnt see the kids at the door), I hooked the smoke machine to the computer as well. I also decided that having some computer controlled thunder and lightning would be pretty cool as well. For once I had a little more time as I began the new project on August 26, 1999. It was far more work than I imagined. I assumed that since I had a working system already, creating this new communication protocol and converting to it would be relatively straightforward. Wrong. It was way more work than building the original system. That first system was designed to do only one job (the talking skull), and was only expanded mildly to include smoke and lightning duties. The new system was conceived from the ground up as being capable of handling anything I could think of today or tomorrow. I ended up writing tons of software, and designing a bunch of new hardware, all of which had to be created, tested, and debugged simultaneously as all the pieces needed to talk to each other. It was a nightmare. Still, somehow, I managed to actually get it working by Halloween night. True, the system I ran that year was a bit of a hybrid (skull on new system, smoke/lightning on old system), but it worked. I spent some time during the next year improving the software, fixing bugs, and designing more new hardware. Halloween 2000 was the first time running only the new system, and it’s been that way ever since.